Below is The Reading List from the past month. It’s a list of our most read and shared content on social media with the most reach. We don’t include our original content in this list. This list is put together through our own research to find relevant color and print articles and websites that we have shared via social media. The mesmerizing candy sorter. 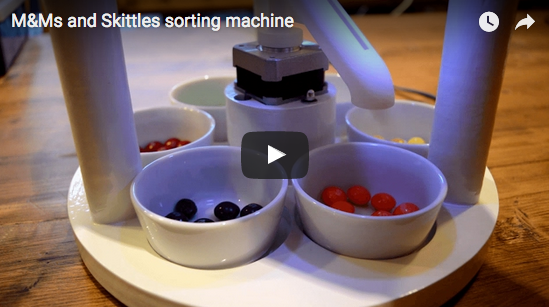 For the OCD candy lover, this machine organizes your candy coated pieces by color. There’s a video! Color-changing dominoes. Mesmerizing was our key word of the month! Our audience must have also liked watching these mesmerizing dominoes as much as we did. Which wedge is best? People might think that we compete with SpotOn!, but the reality is our CEO Jim Raffel and SpotOn!’s founder Bruce Bayne are friends as well as colleagues in the world of G7. So we were happy to share this blog post about print verification and process control to our ColorMetrix community. They obviously found great value in it! The watercolor illusion. The watercolor illusion takes advantage of how our brains perceive shapes and colors. People are at odds as to what colors are inside these squiggly lines. What do you think? Don’t miss out on the conversation! Did you like this month’s Reading List? Want to have access to our content shares from around the industry throughout each month? The best way to do that is to like our Facebook page and/or follow us on Twitter. Also if you see any industry news that should be on our Reading List, let us know! !